Reminiscent of that zany cartoon series, SpongeBob SquarePants and even Ren & Stimpy, the Marvelous Misadventures of Flapjack is of a similar vein and focuses on Flapjack, a young boy who has a pirate for a friend and was raised by Bubbie the whale. Yup.. it's truly bizarre! Featuring Flapjack a variety of episodes from the series, The Marvellous Misadventures of Flapjack generally involves the gang getting into all sorts of mischief, finding "treasure" and of course getting in everyone's way. The characters in the cartoon are quite relatable and entertaining to watch and even adults will enjoy some of the content of this series. The comedy is quite clever and whether it’s about Captain K’Nuckles or the strange whale Bubbie, the stories are quite diverse and colourful at the same time. On the DVD, the video quality is oozing with colour and although simplistic at the best of times, it suits the cartoon perfect. The sound quality of the DVD is great but what makes it so entertaining is the professional voice acting, especially by Brian Doyle-Murray as Captain K’Nuckles and Roz Ryan as Bubbie who really go “overboard” with their characters. 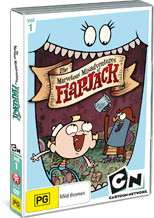 Although it’s probably won’t be the most memorable cartoon in the world, The Marvellous Misadventures of Flapjack does go out of the comfort areas of most traditional cartoon series and seeing the Cartoon Network try something different actually works quite well on this occasion with its goofy and oddball anecdotes of the characters involved.